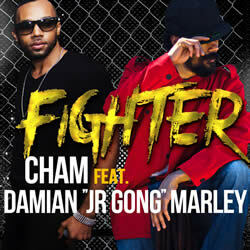 Cham & Junior Gong set to shoot video for "FIGHTER"
International artistes Baby Cham and Junior Gong is all set to shoot the video for their hard-hitting collab “Fighter” produced by Mad House Records. The artistes flew in in the island a day ago to prep for the video to be shot and also to promote their collaboration ‘Fighter’. Since the release of the fiery collaboration “Fighter”, the feedback has been nothing but positive as the song seeks to motivate, to empower people, to strive and work hard towards their goals and never give up. According to the prolific deejay Baby Cham, “Dave Kelly (my manager) called me at about 5:30 am one morning with a hook which is now the chorus that Gong sings. At first Dave was thinking of using Akon because we have worked in the past but when I really listen to it I was feeling Junior Gong. I know he would bring a different dimension to it and that is when Dave Kelly said I should reach out to him. Already UK and Us media houses have been asking for the video from the two musical fighters and so that has pushed them more to shoot the video quickly. The video will be directed by renowned videographer Mykal Cushnie. He says “the video will be one to look out for as the production will speak volume to the story-line of the song. The song he says is a relative one and so people will immediately relate and picture themselves as of of the characters in the video”. The video will incorporate several parts of the ghetto and show contemporary Jamaica through the director and the artistes eyes. The artistes currently have a #FighterMovement campaign running on social mediums Twitter and Instagram. Tweet or post what you are a ‘fighter’ against and use hashtag #fightermovement and the artistes will retweet or repost. @thecham @damianmarley.